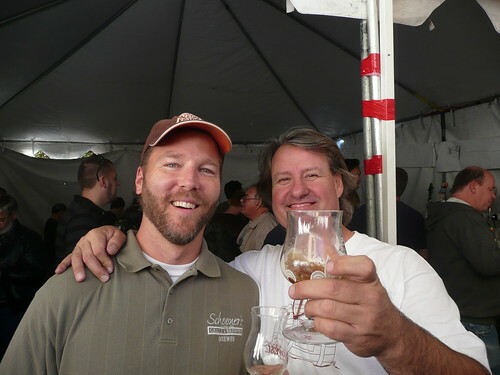 Today is the 52nd birthday of Craig Cauwels, who started brewing at Schooner’s in 2003, when his longtime friend Shawn Burns needed his help, and he continuing brewing there until after Burns sold the brewpub to a new owner. For a time, he was also brewing at E.J. Phair brewing, and even went back to brewing at Schooner’s part-time, splitting his time between the two East Bay breweries. More recently, Schooner’s has a new owner, who shut down the brewpub, but moved the equipment to a production space in Tracy, and is rebranding the brewery as Morgan Territory, where Craig doing all of the brewing. They even brought home their first medal from GABF two years ago, for a beer Craig made at Schooner’s but under the Morgan Territory name since the BA allowed them to enter under the new name even though they hadn’t opened yet, which is pretty cool. Of course, the brewery is now open and has a taproom you can visit, too, enjoy a beer and take home a growler. Originally a molecular biologist, Craig was running the core lab facility at the Dana Farber Cancer Institute at Harvard University when he gave it all up to become a professional brewer. And that’s certainly been good news for people who love great beer, because he’s a very talented brewer. Join me in wishing Craig a very happy birthday. Craig with Vic Krajl at the 2009 Bistro Barrel Aged Fest. 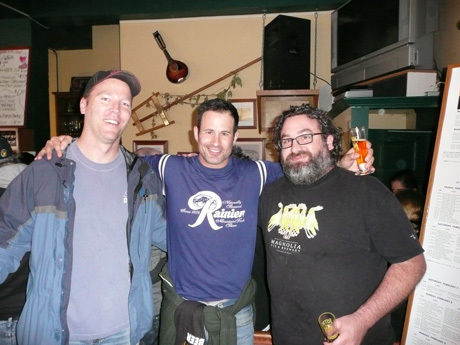 Craig with Sam Calagione (from Dogfish Head) and Dave McLean (from Magnolia’s) at the Double IPA Festival at the Bistro a couple of years ago. 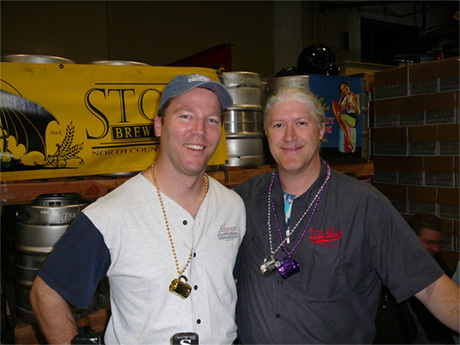 Craig with Steve Altimari, from High Water Brewing at the Celebrator’s 18th anniversary party in 2007. 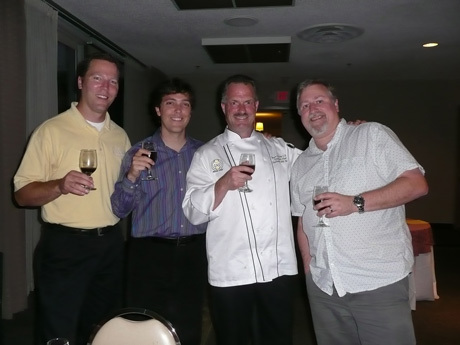 Craig with Brian Yaeger, the Beer Chef Bruce Paton and me at a Schooner’s beer dinner at Cathedral Hotel in 2008. Feliz cumpleanos from me & all my fellow Delta Brewing Clubbers who’ve been enjoying your products for a long time. You make one helluva barley wine, which we hope there will be some of to enjoy at our Xmas party on 12/21! Happy Birthday Craig!! Your beers are the best. Hey Craig you are the best!! Happy Birthday, hope the day is great & the night is even better. Thanks from the Delta Brewing Club for the friendship & support thru out the years … Keep On Brewin ‘ …..
One darn nice guy that always has a smile and a love of all good beer. I going to be happy when I can get some of the Morgen Territory beers in our neck of the woods. Hey Craig HAPPY BIRTHDAY & once again I want to thank you for your friendship & kindness to me as well as the DBC over the years!! You are not only a gentleman but the best damn brewer I know. Keep brewin’ the great beers we all love and hope to see you soon at Morgan Territory …..
Hoppy Hoppy Beerthday Craig! Enjoy your special Day….we can Celebrate on Saturday 11/24 at the Beer Depletion Party!